Recently, I’ve been having a bit of a hair ‘mare. As much as I love being blonde (definitely more fun…), the bleaching, highlighting and heat styling has played havoc with the condition of my hair, which used to be soft, silky and so low maintenance it seems like a dream. Even after I opted for a long bob at the end of last year, the texture was still quite dry and I suffered from the dreaded frizz. Prior to going blonde, my hair was in perfect condition. Much to my colleagues annoyance, I’d stroll into work with my hair in a messy bun and still damp from the shower but by afternoon my air dried hair would be a tumble of glossy waves, not a hint of frizz in sight. Needless to say, having knots and tangles to contend with has taken some getting used to. I found that using heat really helped combat frizz and make my hair look healthier and glossier, but obviously all of that heat just made the condition of my hair worse. I eased off the GHDs in favour of Babyliss Big Hair (which is amazing) but also started giving my hair some proper TLC, my last ditch attempt to have nice blonde hair before admitting defeat and going back to a less damaging hue. I think I’ve finally cracked it and I’ve been enjoying soft, glossy locks over the last week or so. I have to confess, I’ve never been one for fancy shampoos; I figure it’s only on my hair for a couple of minutes which isn’t long enough for anything to make a drastic difference. However, shampoo suddenly becomes pretty important when you’re blonde, it’s the key to stopping your hair looking brassy. 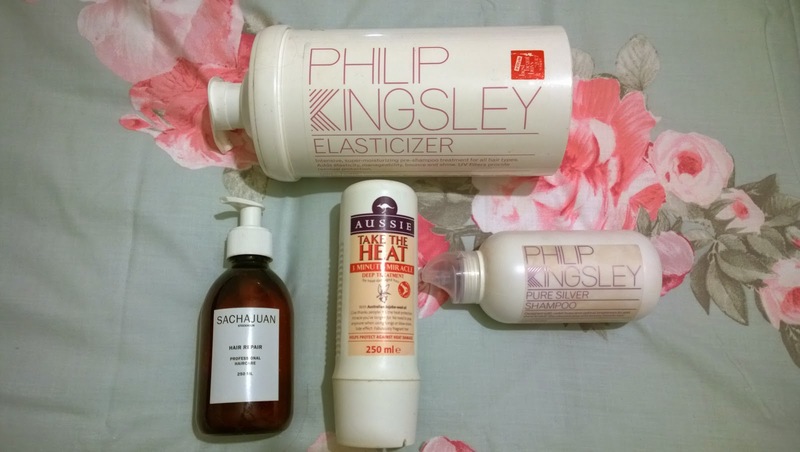 I currently use Philip Kingsley’s pure silver shampoo which is a dream. After I’ve washed my hair, I use Swedish haircare brand Sachajuan’s Hair Repair treatment which came highly recommended by my hairdresser at Joe’s Salon. I recommended the overnight version to Grazia a couple of months ago, but both are fantastic. Hair Repair uses Sachajuan’s Ocean Silk technology and nutrient-rich algae to stimulate cell regeneration and forms a non-oily film around each hair fibre to reduce frizz and enhance shine, resulting in stronger, bouncier, happier hair. I leave this on as long as possible, preferably overnight then rinse it out in the shower. The final step is conditioner, I swear by Aussie’s 3 Minute Miracle and use it sparingly but every time I wash my hair rather than a weekly treat. Long winded and a little high maintenance it may be, but honestly this combination has transformed my hair over the past week. I washed out the Hair Repair this morning and let my hair air dry on the way to work, expecting the worst by the time I got to the office but to my surprise there was no frizz at all and I’ve been stroking my hair all day. To me, that’s more than worth the extra steps in my hair care routine! I'm a massive fan of the Three Minute Miracle, though I tend to wrap it up under a heat cap and give it a good half hour! I haven't used the other products you've mentioned though!